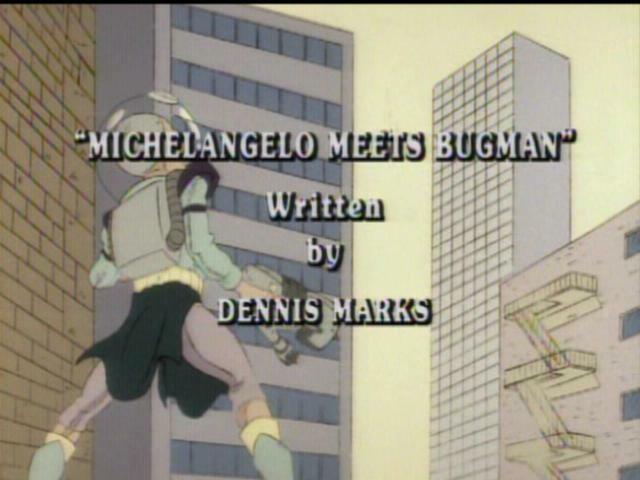 Michaelangelo avidly reads a comic book which features his favorite superhero, Bugman, a half man, half insect fighter who battles for truth and justice. While reading one of the comic books, Mikey hears a cry for help in the sewer. To his surprise, Michaelangelo rescues Brick Bradley (Bugman in his human state). One of his enemies, Electrozapper, tied him with chains made of Leestanite, which affects Bugman as Kryptonite harms Superman. After hearing what happened to Bugman, Michaelangelo decides to go with him to fight Electrozapper. He leaves a note for the other Turtles telling them where he has gone. When the Turtles find Michaelangelo’s note, they begin to laugh, thinking that it’s one of his practical jokes. Bugman takes Michaelangelo to a power plant where Electrozapper is hiding out. When they arrive, they find April walking around investigating the plant. They locate one of Electrozapper’s antennas and destroy it. Electrozapper comes out to see what happened to his antenna and is greeted by Bugman and Michaelangelo. After a long battle, Bugman and Michaelangelo get captured by Electrozapper. The villain brings them to his hideout and hooks them up to one of his machines. The ‘zapper plans on draining our heroes energy and transferring it to himself. At the lair, the Turtles begin to wonder if maybe Michaelangelo was serious about going with Bugman. They decide to go out looking for him. They arrive at the power plant in time to rescue April from a fire. In the hideout, Michaelangelo manages to get free and also frees Bugman. The other Turtles arrive at the hideout in time to help Michaelangelo and Bugman defeat Electrozapper. Electrozapper gets arrested and Bugman flies off into the sunset.